19 to speak with Airmen and tour Team McChord. FORWARD OPERATING BASE SALERNO, Afghanistan, June 9, 2008 – Soldiers from Combined Task Force Currahee recently test-drove a new vehicle that could help alleviate some of the problems they have maneuvering through Afghanistan’s mountains and valleys. The enhanced logistic off-road vehicle, known as the ELSORV, may be the answer to navigating Afghanistan’s rugged terrain. Three prototypes are being tested. 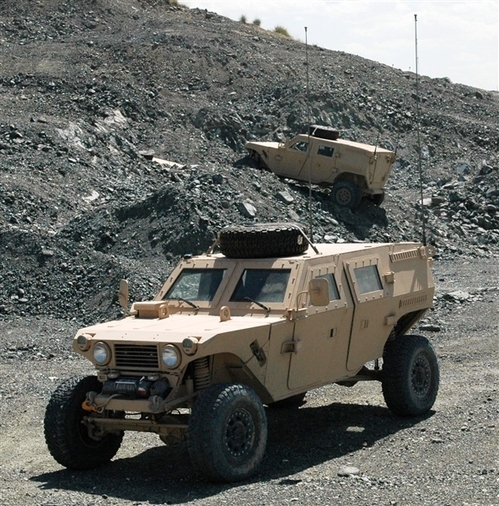 Afghanistan’s rocky terrain makes the going slow and difficult for supply convoys, evacuation and basic ground transportation. All three prototypes are in Afghanistan so soldiers can learn how they handle in the terrain. Over the past year, the ELSORVs went through operational assessments in the United States, and now they are here for a real-world assessment by the soldiers who could end up using the vehicles. Copsey said ELSORVs can carry 2,700 pounds, and they have modified Humvee engines that can conquer approach angles of 90 degrees and climb slopes at 80 degrees. “As long as they have power going to one of the wheels, they’re going to stay mobile,” Copsey said. The ELSORVs allow soldiers to go over obstacles without getting hung up on the undercarriage. The vehicle can go 90 mph safely on a hard surface. “The best place for these vehicles is here in Afghanistan,” Davis said. As the last of the surge units return home (Fort Lewis's 4th Brigade), the Christian Science Monitor looks at the improved situation on the ground. Click here. News organizations are marking the 2nd anniversary 1Lt. Ehren Watada's refusal to deploy with the 3rd Brigade to Iraq. Click here for one example. We found this today....click here. twelve-month deployments in the CENTCOM theater for active Army units. prior to 1 August will complete their scheduled deployments. Kenneth O. Preston George W. Casey, Jr. Here's a nice story from the Seattle Times on the quilts made for hospitalized soldiers. CSM Tommie Williams called this morning from Iraq to talk with me about the progress being made to stand up the Iraqi Army and police forces. Williams is serving in the Multi-National Security Transition Command – Iraq. From the sound of it, progress is being made. “We’re building the security forces across the country,” said I Corps and Ft. Lewis’ former Command Sergeant Major. “The teamwork is there; the good work is there; we are making significant progress on all fronts,” he added. Williams also pointed out that American combat forces have been vital in setting the conditions that have allowed the Iraqi police and army to take on their own security operations. “The surge worked well; it has set the conditions for that have allowed for success,” continued Williams. “But I also want to point out that the Iraqi Army also sent in double the amount of brigades we did in order to stabilize the country,” he added. The command sergeant major singled out Fort Lewis’ 4th Brigade, 2nd Infantry Division for its work in the Diyala Province and the 62nd Medical Brigade for its countrywide medical mission. “Soldiers from Fort Lewis have done a phenomenal job in carrying out the mission objectives,” added Williams. “And Fort Lewis soldiers and their family members have every reason to be proud,” he added.